Bioroids and Bombots: Weapons: 50x330mm Supershot. 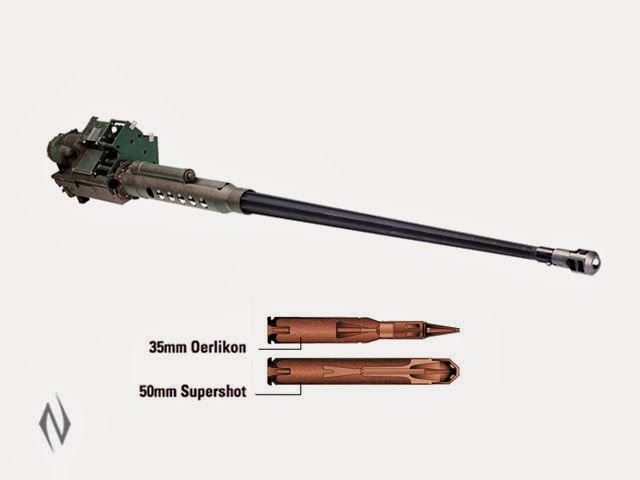 The 50 x 330mm Supershot autocannon is a modern real world weapon that is very likely to be encountered on the worlds of TS. It has recently been proposed as the armament of several heavy infantry fighting vehicles or armoured personnel carriers, competing with the 30/40mm Super Forty. It is also suitable as the main turret armament of missile-armed tanks such as the Wolfhound. It has a similar performance to a 55mm Emag but is lighter and requires less power. The stats below are for the Mauser version. 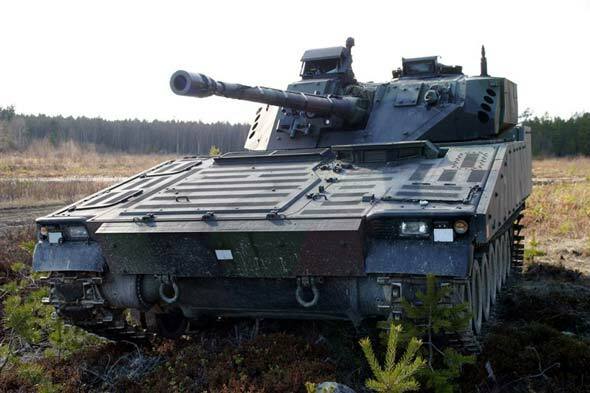 Alliant Tech Systems offers a Bushmaster III in the same chambering which is used in Dutch and Danish CV90s. (Bushmaster III Rof 3; EWt 481 lbs; Pow 2.2kW) Both weapons have dual-feed and can fire single-shots as well as fully-automatic. TS-era versions are likely to be lighter, may incorporate burst-fire mechanisms and use programmable-fused and homing ammunition. TS improvements in explosives are likely to improve round performance and HEMP and SEFOP rounds are likely. The 50mm round is probably large enough to accommodate a 1lb/1 hex cyberswarm. Optics and advanced sighting systems may provide an additional bonus to the Acc given in the table. The following table was adapted from the 3e rules on this page. AHEAD ammunition is effectively a shrapnel shell (HT 4e p.173) that can be programmed to explode at a range set at the moment of firing. It is primarily intended to engage airborne targets. The original 35mm round contained 152 x 5.85mm diameter 3.3gm tungsten pellets. The 35mm KETF (Kinetic Energy Time Fused) variant had 341 x 4.65 mm diameter 1.24gm pellets and an anti-UAV version had 840 x 0.64gm projectiles. The 3e Damage stat above therefore seems rather unrealistic for a round of this type. Explosive content would actually be a modest ejection charge. I do not have any information on the contents of the 50mm AHEAD round. It may be the 50mm round is the 35mm AHEAD shell in a sabot. 6d x 7(0.5) pi++ is the KE damage from an intact shell. In 3e rules [4d(2)] is treated as four 1d(2) attacks from the ejected pellets. Using the rules in HT 4e p.166 & 172 based on 6d x 7 damage the pellets of an AHEAD are 3d(2) pi; RoF x 152; Rcl 1 and KETF 2d(2) pi; RoF x 341; Rcl 1. Anti-UAV: 1d+1 (2) pi-; RoF x 840; Rcl 1. The pellets get an armour-piercing modifier for being tungsten and high-velocity. HEPF (High Explosive Pre-formed Fragment) is a fragmentation round programmed to airburst at a set distance. The desired distance can be programmed into the fuse at the moment of firing. Such rounds can be exploded above a target to negate the effects of vertical cover. They can also be exploded in close proximity to small/fast-moving targets.